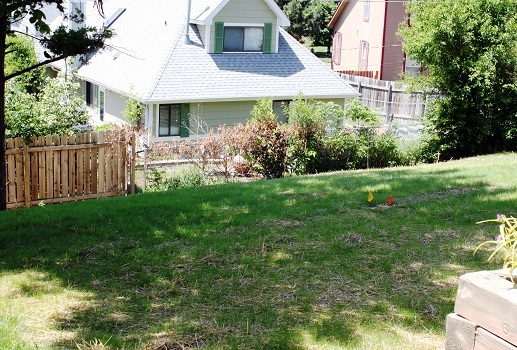 A month before the picture was taken, this yard was bare dirt. You can see how it is very possible to get a great lawn from seeding. For the project, ValleyScapes installed and graded new topsoil to make the slope more gentle. After yard grading, ValleyScapes made sure the soil was adequately tilled & pulverized before installing new fescue seed with a drop seeder. Because of water runoff, straw was spread and crimped into the topsoil after seeding was complete. In order to achieve the above result, the homeowner kept the seedlings moist during their germination period (10-14 days) via sprinklers. The straw helped keep moisture insulated on the seedlings and prevented water from eroding seed out of the dirt. When a yard is bare dirt and needs to be seeded for the first time, we call this Primary Seeding, which is often the case for a newly constructed home. Another instance of primary seeding is when a lawn has become so thin or so run over with weeds, that everything is removed. 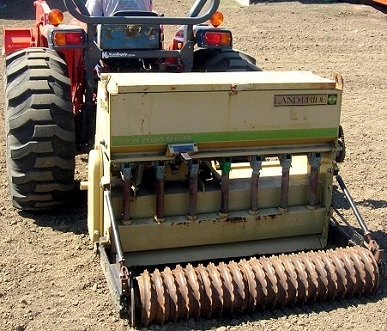 In many of these cases, a sod cutter will be used to cut out the existing vegetation, the soil will be tilled and pulverized, and new seed will be dropped into the soil. In any instance of primary seeding, the seed is equitably distributed into the newly cultivated soil. Too much seed can be bad for a new lawn, and too little seed will make for a very patchy lawn. 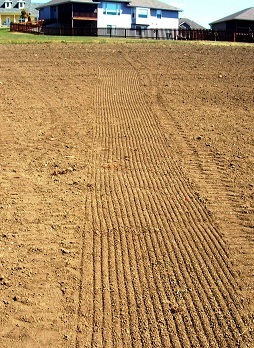 In many cases of primary yard seeding, straw is used. ValleyScapes suggests installing a layer of straw when primary seeding. The straw will help new seedlings from washing out and will also help keep moisture on the seed while it's germinating. If seed dries out while germinating, it dies. Straw is not necessary when overseeding an existing lawn, because there's already existing grass blades to help keep moisture on the new seed as well as prevent seed washout. The machine you see in the two above pictures is an overseeder attachment for a tractor. When overseeding a lawn with existing grass, ValleyScapes will either use this machine or a walk-behind unit for smaller yards. Overseeding or reseeding refers to the idea of installing new seed into an existing lawn. Slice seeding or Verticut refers to the method employed to achieve that overseed. The machine you see above is a Verticut or Slice Seeder. How Does Slice Seeding or Verticut Work? As you can see in the above-right picture, there are knives on a shaft. These knives slice or cut lines into the soil of an existing lawn. The knives are mildly dethatching the buildup of debris under the lower canopy of grass. After the lines are cut, seed is dropped through the tubes you see in the above-left picture. The seeds are dropped right into the line that was just cut by the blades. 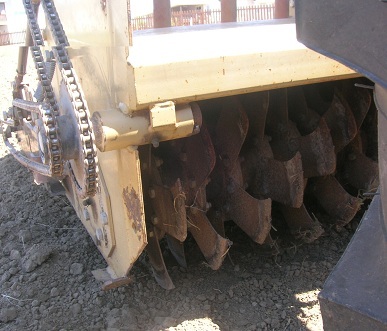 After the seed is dropped, rollers (above left) push the new seed into the dirt. The end result is efficiently distributed seed that has the best seed-to-soil contact possible (seed needs to be in touch with soil in order to germinate and start growing roots). Verticut seeding is superior to seeding by hand because the seed is embedded into the soil better, the lawn is dethatched, which lets more water and nutrients into the soil, and the perfect amount of seed is distributed. Spreading too much seed per square foot can cause too much grass seed to germinate, out compete one another for nutrients, and die. Yes, you can go from bare dirt to a new green lawn with seeding, but it requires some easy post-seeding care. Yes, ValleyScapes can overseed your yard and get those patchy or dead fescue areas filled in with new grass. Whether primary seed or overseed, the new seedlings need to stay moist during their germination period, which is typically 10-14 days. We don't suggest a fixed time of watering other than whatever it takes to keep the seed moist. The reason for this is that wind, heat and soil composition all influence how much moisture the ground will hold and for how long. Due to this, there's an extraordinary amount of factors that will change the water frequency for a given yard. Keep in mind that it is possible to overwater new seed. Overwatering causes the seed to dislodge from the topsoil, drown and die. A sign of this will be if you start seeing puddles of water in your yard. After a few weeks of watering and when your grass starts looking as the above-right picture, it's time to taper off the watering. At this point, there are very small roots established, so you want to stress the new grass just enough so that the roots are forced to grow deeper into the soil looking for water. Stressing the grass means cutting off its water supply temporarily. If you stop watering completely, the grass will die. Remember that new seed takes a good year to establish a strong, mature root system that will survive drought conditions. Until that point is reached, you need to keep an eye on it (note the difference in the above-right photo between one-month-old seed and mature grass in the far left). After your new grass gets 4" tall, mow it. Use a push mower, bag the clippings, cut off no more than one-third of the total growth and give the lawn a deep watering right after mowing. Observe these practices for the first several months as your new lawn is establishing. Use a push mower instead of a rider, because you don't want the weight of a rider mower disrupting the new baby roots. Bag the clippings, because you want as much sunlight and water to penetrate the soil/ grass as possible during the establishment phase. Cut off no more than one-third of the total growth, because you want to keep the grass healthy and long. Cutting the grass too short, especially during the establishment phase where there are no significant roots yet, can easily kill the grass. Deeply water the grass right after mowing because the first few cuttings will stress the new grass, which has never been cut before. 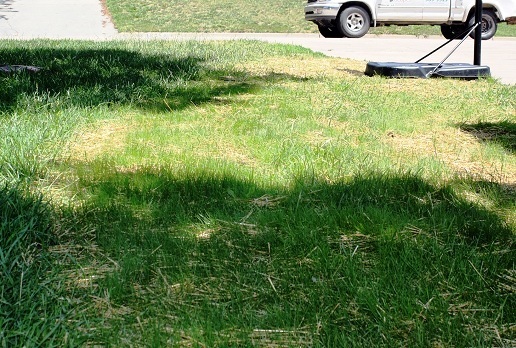 Not watering after mowing can kill some of the new grass. We suggest putting down another application of starter fertilizer four weeks after the initial seeding.